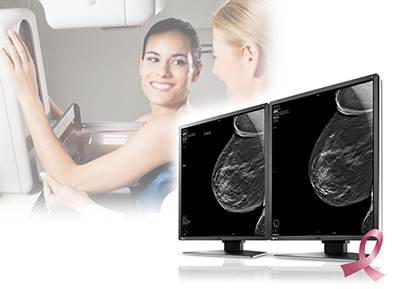 Hakusan, Japan, November 1, 2016 – EIZO Corporation (TSE: 6737) today announced the release of the RadiForce GX550, a 21.3-inch 5 megapixel monitor for viewing detailed digital breast tomosynthesis and mammography images. It is the successor model to the RadiForce GX540 and features superior imaging capability and ease-of-use. A medical monitor needs to be capable of high brightness in order to meet performance standards. However, in order to achieve high brightness in an LCD panel, the pixel aperture ratio has to be increased. This causes a typically unavoidable decline in sharpness. 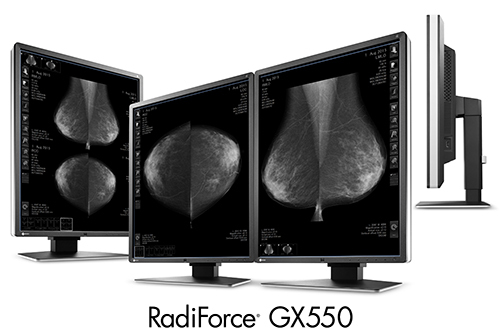 The RadiForce GX550 features EIZO's unique Sharpness Recovery technology, with which the decrease in sharpness (MTF) is restored. This allows healthcare professionals to display an image safely on the monitor that is true to the original source data, even at high brightness levels. The monitor's new design features thinner, black front bezels, making it easier to focus on images in dark reading rooms, while the original white stripe design around the sides of the monitor presents a fresh, clean aesthetic to promote a comfortable, user-friendly environment. For keeping workspace efficient, the monitor's width, height, and depth were reduced by 21 mm, 36 mm, and 45.5 mm respectively - a 28% difference compared to its predecessor. The width of the side bezels were reduced by approximately half to 13.5 mm - the thinnest in the industry for 5 megapixel monitors. This allows users to comfortably view two monitors side by side to compare images.